The ubiquity of cell phone cameras makes capturing images routine and easy. And inexpensive camcorders the size of a deck of cards let anyone record high definition video. But sound is often an afterthought, particularly in the mobile world. Cell phones and other portable devices are rarely known for the quality of their audio, and most consumer video cameras make do with a cheap microphone. Even worse, the microphone is usually positioned in a way that guarantees your eye-popping images will be accompanied by an audio track that sounds like it’s coming from the bottom of a well. Until fairly recently, would-be audiographers needed heavy and expensive equipment to capture quality sound. The inconvenience of the task put off all but the most dedicated. Fortunately, the advent of the iPhone, along with specialized audio recording software and hardware, raises the possibility that you can carry around a high-quality recording studio in your pocket. To help you get started, we’ll look at two versions of Audiofile Engineering’s FiRe Field Recorder app, along with two hardware options for boosting the quality of the sound you capture. On the software side of the equation, FiRe, $10 in the App Store, offers an impressive range of features that will make audio pros feel at home. More recently, a free version of the app—Blue FiRe—has been introduced, in conjunction with Blue Microphones. Blue FiRe offers a very respectable subset of the capabilities of the full price version—I’ll detail distinctions below. Blue Microphone worked with FiRe’s creators to provide users of Blue’s Mikey iPhone/iPod stereo recording microphone with software to support the device, according to Blue executives. The Mikey is one of the hardware options we’ll examine in this article. And even though Blue FiRe is distributed by Blue Microphone, the free application works with all supported iPhone microphones, including the phone’s own built-in mono microphone. For the Record: FiRe Field Recorder’s look will be familiar to anyone who’s ever recorded audio, with VU meters, an audio waveform display, and a timer among other standard recording features. To put it simply, FiRe is a delight to use. The app packs a great deal of functionality into a package that’s attractive, logical, and easy to navigate. In addition, the app contains a number of thoughtful features, such as automatically flipping the display when the iPhone is turned upside down for recording, that work to smooth the recording process. FiRe starts with either a list of recordings or, depending on where you left off, from within an existing recording. From the recording list, you can scroll through and listen to existing audio files, delete recordings, and download them to a computer via a built-in Web server. Selecting a recording or starting a new one takes you to the Transport display. Its operation will be intuitively familiar to anyone who has recorded audio—an elapsed timer is located at the top, followed by VU meters, an audio waveform display, and a set of record/stop and play buttons. A set of icons along the bottom of the application provide access to information about the recording, a dictionary’s worth of metadata fields, recording settings, and additional sharing options. Elements of the Transport display can be customized, including the format of the elapsed timer, the style of VU meter, and the waveform color scheme. The Information tab provides the option to edit the name of the recording, and contains standard information such as format, length, and date/time stamps. A nice touch for those truly in the field is the ability to capture both the location (via Location Services) and a photo of these scene (with either the iPhone’s built-in camera or from the Photos app). Recording options for a given file are made via the Settings tab. (FiRe allows default settings for all recordings to be manipulated via the iPhone Settings application.) Settings are divided into four groups—Input, Transport, Recording, and Playback. While the Input tab provides a master gain control, you’ll want to use it only to find a base input level. It’s faster, and far easier, to actually ride the gain during a recording using the built-in control on the Transport display. Input settings also provide support, via an iZotope plug-in, for various sound processing effects—hiss reduction, noise gates, and various audio enhancements. You can enable playthrough—the ability to listen on a headset to the recording as it’s created—here. Transport provides customization options for the way the screen looks, including color scheme, markers (which are set by tapping on the waveform while recording), and the audio meter scale. The Recording tab delivers the bulk of controls over the operation of the application. A Countdown feature—which automatically starts a recording while providing a visual cue—is enabled here, as are options to automatically add markers to recordings, place a limit on the overall duration of a recording, and other options. Just like photos, audio files support a mix of metadata—information about the recording that’s embedded in the physical digital file. This could be information about where a recording was captured, by who, copyright notices, comments, as well as specific data associated with types of recordings (e.g. AIFF). The full version of FiRe provides built-in support for seven different formats of metadata—AIFF, WAVE, Core Audio Format, Ogg Vorbis, iXML, and SoundCloud. A boon for transcriptionists, musicians, and speed listeners is support for variable speed playback (from 0.5x to 1.5x in five steps) while retaining proper pitch. Once you’ve captured your files, FiRe delivers multiple options for sharing the output. (There are no editing or mixing capabilities in the application.) The first is a built-in Web server—turn it on, point a browser at your phone, and you’ll see a list of recordings ready for download. You can also upload the files to an FTP server, or take advantage of built-in SoundCloud integration if you have an account with the sharing service. Recordings made by the application are created and stored in Apple’s Core Audio Format. You’re provided, though, with numerous formatting options when offloading files. FiRe supports uncompressed files in its native CAF format as well as in AIFF and WAVE. You can create compressed files in AAC, Podcast (MP3), Apple Lossless, FLAC, and Ogg Vorbis formats. A recent update to FiRe changed the way the app handles the creation of compressed files. The good news is that hardware encoding is now used on the iPhone 3GS, the late 2009 model iPod touch, and the iPad, significantly speeding the task. The downside: those encoding options are, for now at least, no longer supported on older devices. The developer has promised to return the capability to these systems at some point in the future. What about differences between FiRe and its free sibling, Blue FiRe? FiRe is designed as a tool for pros, and the limitations of the free version reflect that distinction. Perhaps most important, Blue FiRe eliminates the ability to compress files. You’ll need to download the full-size original in Core Audio, AIFF, or WAVE format. Second, there is no built-in gain control, and a small waveform of the entire recording, useful for tracking your position in the file, isn’t provided. Third, the bulk of the metadata options are eliminated. Some recording features—like overdub, playthrough, and the iZotope sound processing—go missing, and SoundCloud integration isn’t available. You’ll also find some of the “nice to have” features, such as variable rate playback, are cut from Blue FiRe. What about hardware? The iPhone, of course, comes with a built-in microphone. While it’s adequate for simple jobs, its limitations, such as mono-only recording, are quickly revealed. For this review, I considered two options for stepping up the quality of your audio capture—Blue Microphone’s Mikey and ProTrack from Alesis ( ). Both devices add more sophisticated microphones, stereo recording, and a range of other features to improve the quality of sound recordings. Simple Sound: If you’re looking for a plug-and-play solution, Blue Microphones Mikey is a fine audio add-on. Blue Microphones Mikey was introduced in late 2008 to support audio recording using various models of iPod. With a retail price of $80, Mikey is somewhat more expensive than similar devices, but delivers high quality sound recording in a petite package. Almost exactly as wide and thick as an iPhone 3GS, Mikey plugs into the dock connecter and extends the phone by about two inches. The housing containing the stereo capsule condenser microphones rotates through 180 degrees. That flexibility makes it easier to direct the microphones toward a sound source while still being able to see the front of the phone. Mikey provides a limited gain control using a small switch on the rear of the device. Three settings—high, medium, and low—are suggested for various types of recordings, such as voice or music, and venues (i.e., a lecture hall or a one-on-one interview). An indicator light on the front of the device reveals the current gain setting. The gain control works well enough with sources whose level doesn’t vary much, but it’s inadequate for more dynamic recordings. 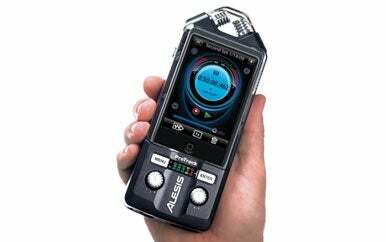 Mobile Sound Studio: XLR inputs and individual channel gain controls help the Alesis ProTrack thrive in demanding recording environments. The Alesis ProTrack has a list price of $399 but is widely available for considerably less than half that amount. It takes recording in a more complex, but still portable, direction. The device itself is relatively large—about seven and one-half inches long, just under three inches wide, and not quite two inches deep. The ProTrack provides a sled, with dock connecter, into which your iPhone or iPod is placed. Two built-in condenser microphones are placed at the top of the unit, while independent gain controls for each channel are located at the bottom of the unit, just below a VU meter. The ProTrack also provides built-in XLR style input jacks, along with 48-volt phantom power, essential for supporting the traditional connector style for audio cabling. The device is supplied with an AC power adapter, but also operates using four AAA batteries. The ProTrack provides a built-in screw mount, allowing it to be placed on a tripod or stand. You’ll probably want to do so, or at least set the unit on a stable surface, since handling the plastic case creates vibrations that can be transmitted to your recordings. A built-in headphone jack provides a playthrough feed that let’s you listen to what you’re recording. There is a hardware limiter, and the device supports mono recording. On the software side of affairs, it seems hard to go wrong with either version of FiRe as the basis for your pocket sound studio. In most cases, given the delineation of features, selecting between the two versions will be fairly simple. 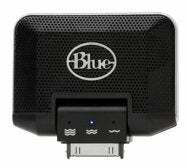 Even with its limitations, Blue FiRe is a top drawer selection for audio recording. For even demanding amateurs, Blue FiRe will address most recording needs handily. And for those who need the full feature set of the pro version—even if just to experiment—the $10 price tag is a bargain. The hardware choice is a bit more complex. Both Blue Microphones Mikey and the Alesis ProTrack offer high quality stereo recording in a portable package. But the similarities end there. Mikey defaults to simplicity and ease-of-use, so if you’re looking for a plug in and go option it’s your best choice. ProTrack’s enhanced capabilities—particularly XLR inputs and individual channel gain controls—bring greater flexibility and control even in demanding recording environments. This review was published prior to the June 24 release of the iPhone 4. Note that the Blue Mikey is not compatible with the iPhone 4; the second-generation Blue Mikey, set to ship in August, will be certified to work with Apple’s 2G, 3G, and 3GS iPhone models, along with most iPods. 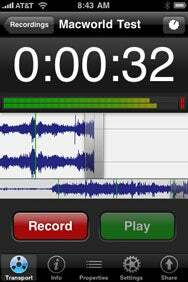 In our tests, the Alesis ProTrack will work with an iPhone 4, though it seemed to record in mono only.